The misunderstanding about the technological difference between Cloud Hosting vs VPS Hosting in the web hosting industry is becoming quite a buzz now. Most of the people generally tend to misread the basic difference between the two. This is due to the lack of awareness about the differentiating factors of these two web hosting technologies. With the advent of virtualization and remote operations, there is a considerable increase in most of the established organizations and even startups opting for the similar solutions to host their websites. They no more need to own a physical architecture (a CPU with the certain specifications of processor, RAM, and storage), an operating system, on top of this hardware, and then the particular web application (like WordPress, Magento, Drupal, Joomla, and many more etc.) on which website is to be hosted. And, that’s not it! Further, this arrangement will require efficient and redundant power supplies and periodic maintenance to ensure the server is up and running at all times. Firstly, let’s jump to basics for a while about what cloud and virtualization are. In simple words, cloud and virtualization is something that separates the hardware, operating system, and the application running on that hardware from each other. The basic concept remains the same in both of the technologies. However, reliability, flexibility, and availability have been some major separating indicators between the two. VPS (Virtual Private Servers) Hosting, sometimes also known as “Private Cloud”, is based on servers which are crafted using virtualization mechanism. The architecture is one which has multiple individual dedicated slots on the same virtual machine. Each slot can be assigned to dedicated resources. Nonetheless, the technology generally works on a time-shared or resource-shared phenomenon. One of the major disadvantages that are stopping the VPS hosting industry to reach to the next level is its vulnerability that can cause a particular slot or resource go down in any crash scenario and the application or website on that particular space will be unavailable with no redundant online availability unless and until the issue is fixed. However, rest of the applications on different slots will be up and running without any disruption in service. But, there remains a possibility, although in exceptional cases, where a major trouble hitting a certain slot, such as unexpectedly excessive traffic on a random day or DDoS (Distributed Denial of Service) attack, can cause the entire machine and the subsequent applications to go down as all the resources belong to the same machine. 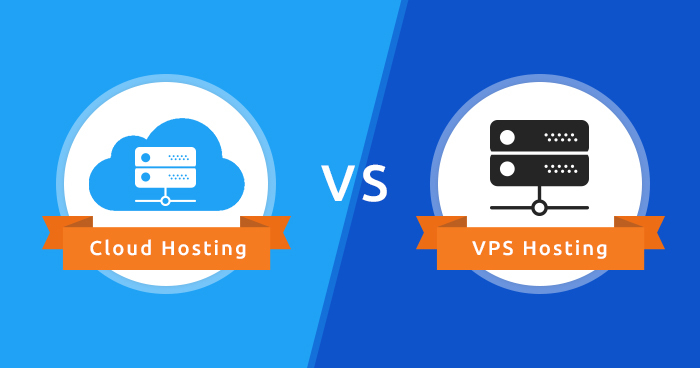 However, VPS hosting does have some useful points as it brings the margin closer between the dedicated and shared hosting solutions. ◈ VPS hosting offers total and complete freedom. Free to manage your server as you like, you have access to everything and you can install all the software you need. ◈ Hosting in VPS is very efficient. Unlike shared hosting, the VPS is not dependent on traffic or audience. You have your own resources and you are isolated from other servers. ◈ Hosting in VPS is secure. All your files are private and inaccessible to other clients regardless of their rights on the server. Cloud hosting is the top-of-the-line website (or application) hosting solution available presently. The technology has already achieved a tremendous level of acceptance in a short period of time. In other words, cloud runs the web hosting services, like files storage, SSH, FTP, SFTP, and email services (for e.g. SMTP), etc., on many different servers simultaneously. This simultaneous allocation of equal resources on the cloud servers in the cluster provides a great deal of reliability. For example, if one of the machines malfunctions, it will not cause a failure or disruption in the entire hosting service. ◈ Cloud hosting is relatively reliable because your website is hosted on a virtual partition that takes advantage of multiple physical networks. When one of the servers goes offline, it will slightly reduce the resource level to the cloud but will not add up to your website. No inaccessibility or anything else. ◈ Cloud hosting is secured by many physical servers that are protected from third-parties who want to access their premises or interrupt their services. ◈ Cloud hosting is extensible, flexible, and scalable. It does not have the same constraints as a single server. Resources are available according to your requests and in real time. ◈ Cloud hosting is economical because you only pay for what you use. The comparison below shows the differences in both the infrastructure. Why Cloud Hosting Stands out as the Best Hosting Solution Available Currently? The cloud-based hosting, however, is more stable as there will not be any effect on performance when a part of the component goes down as it is decentralized.